Sandra Branney was born on 30th April 1954 in Glasgow where she still lives. She is also a member of a Glasgow club – starting with Victoria Park AAC, she moved to Glasgow AC and now that the two clubs have merged she is back with City of Glasgow Victoria Park. She is identified with Glasgow every bit as much as Liz McColgan is with Dundee. According to an article in the “Scotland’s Runner” magazine in November 1986, she took up running in 1983 on the prompting of her husband Donald and has had a most remarkable career since. “When Sandra started running three years ago, Donald used to have to ‘drag her round the block’. Now he has been left trailing gamely in her wake.” Donald is clearly a major factor in her success and she admits as much when she says in reply to being asked about anyone who has had an influence on her performances, “The one person who stands out is my husband Donald who, as he puts it, is ‘right behind me’. Over the years I have read a lot and where possible spoke to people about training and competing. When I decided to go back to track a few years ago, I joined John Montgomery’s group. It was the best move I ever made and my recent track performances are down to John and the rest of the gang.” Although others are mentioned and John is name-checked, Donald is the first mentioned and his importance stands out. She really burst on to the scene in the Glasgow Marathon in 1985 with no background that anyone knew of. At the age of 31 she ran 2:45. If ever the “What if …..” question were to be asked of an athlete, it would have to be asked of Sandra. Clearly an athlete of talent, a gifted athlete, what if she had taken up running earlier? We can’t answer that accurately, although there are formulae to calculate what her times might have been, but we can look at her career in a bit of detail and wonder. As a child between the ages of eleven and fifteen she was a competitive swimmer, she gave up for a few years and then took the sport up again when at University. She started running after she watched the first Glasgow Marathons and she just felt that she wanted to be part of it. She started running (very slowly, she says) just after the 1983 event and ran in the 1984 marathon in 3:40 or thereabouts. After keeping going through the winter she started to get a bit faster and it took off from there. When asked if she had any role models the name of Joan Benoit comes first – she had won the 1984 Olympic marathon when Sandra was just a self-confessed jogger. In total awe of her, Sandra says she couldn’t comprehend how anyone could run so fast. Everything was coming together to encourage her ambitions – The Glasgow marathons, Benoit’s Olympic success and the inspiration it generated and Donald’s support and interest. The swimming background helped with her fitness and she was being coached by Ronnie Neilson at the time of the ’86 marathon. Sandra comments “I ran ’84 and ’85 self coached. I was only coached by Ronnie Neilson for a year or so – early ’86 until late ’87. The quote below was after the ’86 Glasgow Marathon. Her career as a serious runner probably began with that Glasgow marathon. To quote again from the article in ‘Scotland’s Runner’: “Neilson is a keen supporter of the pre-marathon ‘bleed-out’ diet whereby the athlete is starved of carbohydrates for three days (eating mainly proteins) then starts ‘carbo loading’ for the final three days to give the muscles an extra top-up of the glycogen that fuels a marathon run. Sandra, who normally weighs in at 7st 2lbs, had to undergo the withdrawal symptoms that a lot of athletes face during the carbohydrate -starving period. “By the Wednesday morning before the marathon I felt terrible. I was very irritable and didn’t feel much like running a marathon at the end of the week;, she says. “But it worked”, says Neilson, “You only had to look at the way Sandra jumped over the line at the finish to see that she had everything right on the day.” Although she wasn’t too sure about it herself, she says it worked and she incorporated a version into all her subsequent marathons although it was difficult for the overseas races. Her talent was not limited to roads: track running has been and is a big part of her athletics and Sandra is a good cross country runner who twice won the Scottish championship. Having made her debut in 1986 when she finished seventh there was a wee slip the next year when she slipped to eleventhn(“I had a cold but that’s no excuse!) In 1988 at Irvine she won from Lynn Harding by over two minutes. It was reported in ‘Scotland’s Runner’ as follows. 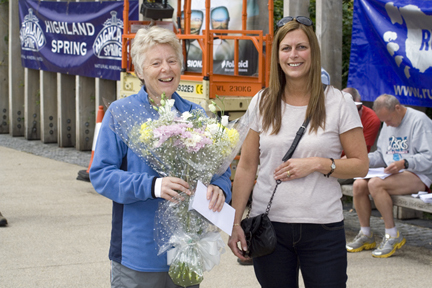 “Sandra Branney led Glasgow AC to a team victory despite the hazards of a poorly stewarded course. The Strathclyde University librarian damaged a hip last autumn and had had only one track race – the Scottish indoor 3000 metres which she won – since October. She sorted herself out largely thanks to running in a special jacket in the university’s swimming pool, and looks in good shape for the World 15K Road Race Championship in Adelaide where she will represent Britain.” Not content with winning the Championship, she returned the following year and won it again. This was the race that Donald thought might have been her best ever simply because of the pressure that she was under to win it again. When an athlete wins anything twice, the question of ‘three in a row’ raises its head – unfortunately for Sandra a third win was not on the cards because she was injured and could not compete. However she continued to race in the championships and remained a valued team member. On the track, her standard of performance has been consistently high and her best times are also good. These are shown on the table below – the road times are added to show the range covered in her early career and the times still stand as personal best performances. She has run all over Britain and even further afield in her specialist track events and in all types of races – League Matches (in the Scottish Women’s League, the UK Women’s League, the UK League as presently constituted), Championships (Scottish and British), Masters/Veterans Championships (Scottish, British, European and World). These track events have brought her some of her best moments in the sport and some of the worst too. In the former category comes the National Track 3000 metres title in 1990. She had been injured for quite a while beforehand and was lacking in confidence. Any one of five women could have won the race and right at the start Annette Bell went off like a rocket and Sandra led the chasing pack. They managed to close her down and with about 300 metres to go, Sandra picked the pace up a bit and got herself clear. ‘ It wasn’t’, she says, ‘particularly fast (about 9:45) but as everyone would agree I don’t have much of a finish, it was quite a good run.’ Donald thinks it was possibly her best ever run. Statistically she reckons her best run must be the W55 3000m record of 10:13.8 which has a score of 103.2% in the age graded tables. It was also only 47 seconds slower than her personal best of July 1989. As for the worst moment – well she is in no doubt about that! “I was selected for a 3000m indoors in Athens which I think was a Small Nations International and it turned out to be the most brutal race I have ever experienced. There was a lot of the usual shoving and pushing so I went to the front to try to stay out of trouble. It was a temporary track and there was a drop of about five cm between the inside of the track and the floor of the arena and remember someone trying to push me off the track. At one point a shoe went flying over my head! When the bell went for the final lap, the others sprinted away (they were obviously used to this) and I finished scratched, battered and bruised. I took a lot from this race and learned how to look after myself. Unlike many who came into running via the mass marathons of the 80’s, Sandra has kept running and racing seriously and has now been competing on a very high level for over 25 years. If there is any doubt about her continuing competitiveness or appetite for the sport, you only have to look at the table below. It shows only her very best track results of the past five years. Eleven first places and three seconds out of fourteen starts. Some of the time she was injured or returning from injury: for example in 2010 she was not going to run because of time out but she went and passed on the 1500 metres because she was not fit enough to do that and the 5000 so settled for the 5000 – and won against the best that Europe had to offer. But see for yourself. *The 2005 time was in the BMAF 5K in Horwich and it was an age group record. Having established that Sandra Branney is a quality endurance athlete on track and country we should go back to her first events and what many regard as her best – road racing. She has run in many races in all parts of Scotland from the north to the south and even off shore (in Millport on the Isle of Cumbrae). The 10K races in the Polaroid series held every year in Clydebank, Dumbarton, Helensburgh and the Vale of Leven are among her favourites – especially the one in the Vale which is traditionally the last in the series with the biggest fields and best competition. The picture above is from the Polaroid Race in the Vale in 2008 where she was fifth Woman and first in her category and she had the same position in the Dumbarton race. However the flowers were for more than just two races in that single year – she has won the Women’s championship (which takes in all four races) no fewer than four times (1990, 1991, 1992 and 1996) and was first Lady Vet in 1993 and 2000. She adds that she set a course record of 34:09 in 1992 which was broken only by Yvonne Murray whose time was only a few seconds quicker. A quite remarkable record. In half marathons, she has had no less distinguished a career with the top possibly being in a race she didn’t win. In the Glasgow Half Marathon of 1998 there was a tough battle between three able and determined women for first place with Lorna Irving, Sandra and Sheila Catford battling it out for the first ten miles before Sheila moved away – not far but enough and Sandra took second place in 73:04. She herself reckons that her best run might well have been the Balloch to Clydebank race when it was over a 12.25 mile course in 1988 in 67:27. A non-standard distance these days her feeling is that it was worth about a 71:00 half marathon time. And of course there are the UK rankings that can also be used to indicate the quality of her running. 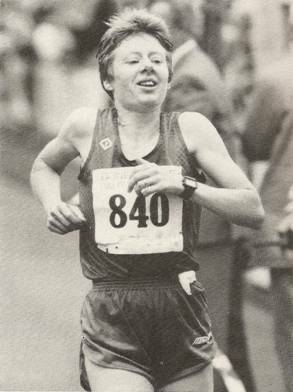 The UK 10 Miles Championship that she won in 1988 in 55:32 is at number 71 in the UK All time rankings and the half marathon best has her at number 43 (although two lists have her at number 32 using the 72:22 time). The first three marathons have already been covered (3:40 in Glasgow, ’84, 2:45 in Glasgow ’85 and 2:37:29 in 1986). She went on to run in six countries on three Continents. 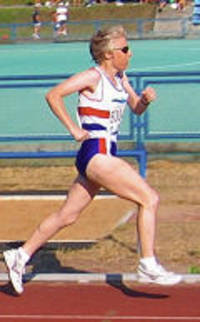 The first of the foreign races was in 1987 when she was selected, along with Fraser Clyne and Lindsay Robertson on the Men’s side, to represent Great Britain in the second World Marathon Cup which was to be held in Seoul over the course to be used in 1988 for the Olympic Games in 1988. It was a long journey there – over 30 hours in all. The teams had four men and four women and John Brown of the SAAA was going on a fact finding mission for the BAAB. They did not travel directly to Korea – there was a four day stay at the Nihon Aerobics Centre south east of Tokyo and was to be used as a holding camp for Britain’s athletes for final training before the Games. The set up was rather luxurious with swimming pools, jacuzzi, saunas, golf course, tennis courts and an outdoor 100 metre pool. Their accommodation was in log cabins on the wooded hillside. They then transferred to the Sheraton Walker Hill Hotel in Seoul over looking the Han River. The course for the race was straightforward with few if any difficult uphill sections. Sandra finished twenty sixth in her first full marathon and her sixth marathon in all so far in 2:40:44 in a field of 78 runners. The British team was fifth with Sally Ellis (18th) and Carolyn Naisby (22nd) the other counting runners. Sandra remembers that it was cold (Fraser Clyne reports the temperature as being about 11 degrees), add in problems adjusting to the time difference and she felt that she was struggling at the end. Nevertheless she was third counter for the team and a reasonable run – after all the men could only manage eight team! The Scottish team on the trip is in the picture below.